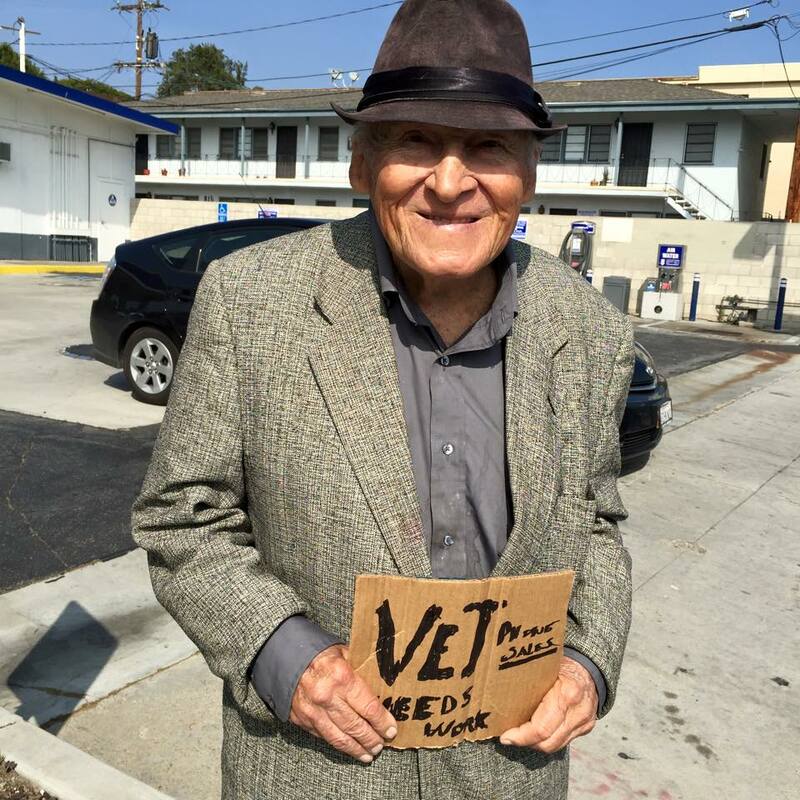 Mr. Vern Frary, the gentleman who inspired us to start this project to help vets in need is sick and in a senior nursing home in Los Angeles. #Globalite Arch went to meet him today to handover a donation on behalf of Globalizm Inc. Here’s how the meeting went. As some of you may remember, I met 85 year old Mr. Frary at a street corner where he was standing with a sign and wanted help to find a job. Many passersby were moved, so was I, so I decided to try and help him. When I sent mailers out to my university alumni lists, a few alumni wanted to make a donation to help Mr. Frary out. So we decided to start a project at Globalizm called Project VET to help Mr. Frary and others like him. When I tried calling Mr. Frary last week, he didn’t answer my call. I vaguely remembered him mentioning a senior home on Washington Blvd. Thanks to the internet, I was able to find the home and called. I heard the nurse saying she was holding Mr. Frary up so he could talk on the phone. Yet he insisted he wanted a job and nothing else. When I called again last night, the nurse thought I didn’t know what I was talking about when I said Mr. Frary wanted a job. Clearly things weren’t looking good. So I decided that I had to see him today by all means and headed out this afternoon with a $100 donation in hand. When I arrived at the home, there was an ambulance with flashing red lights outside. I wondered if it was for Mr. Frary. I walked in through the 911 emergency entrance and saw long narrow hallways stretching across the rectangular sides of the building with a courtyard in the middle. I asked a nurse where Mr. Frary was and he directed me to a nursing station. Luckily the nurse I had spoken to the previous day was around and he took me to Mr. Frary’s room. The room was divided by curtains apparently to accomodate 2-3 people but only Mr. Frary was in the room at the far end. As I walked over, I saw a frail old man with just a blanket over his knees and nothing else lying on the bed. While he looked weak, he was attentive and immediately recognized me as the person he had met at the street corner. He said he was going to be up and about soon and still wanted a job. I told him he should just rest and get better, and said some people had sent donations. He vigorously shook his head and said he “no money, I want a job.” Is there anything else you need Mr. Frary? I persisted. He said, “I just want a friend.” I felt crushed, as he continued to feel surprised that I visited him and that he didn’t get any visitors, and that he was very lonely. After some more chit chatting, I handed over the donation, and I told him I’d come and see him again and as I walked out, he said, “I want to go home”. I walked out and thanked the nurse for what he did. He said, don’t thank me, I get paid to do this – I said, still his care was appreciated. As I walked back through the corridors watching seniors room after room, some dozing off on wheel chairs, others on beds – some in robes, some mostly naked, I was at a loss for words. On the one hand I am thankful to the system for providing care and healthcare to our seniors, on the other hand, I see how lonely and abandoned they are, and that breaks my heart. If there is one thing we can all do, that is to visit a home over a weekend and spend some time with seniors, and we might have added just a little bit of cheer to help them through their days. WHAT IS ALS & #ICEBUCKETCHALLENGE? Really sorry to hear Mr Frary’s condition… hope he gets better soon and be active again. Glad you visited him!